I was born in California, but spent most of my early life in Oklahoma. From 1975 until 2000 I served a 20+ year career in the US Army. After leaving the service I continued working in the defense sector as a consultant supporting the US Departments of the Army and Defense until 2008. I now live in Northern Virginia and organize events for a local hiking group. I enlisted in the Army in 1975 at the age of 17 and served my initial tour as an infantryman. After basic and infantry training I was assigned to a 4.2 inch mortar platoon at Fort Sill, Oklahoma. The “four-deuce,” as it was known, was the largest mortar in the Army inventory at the time, and had the virtue of being too heavy to carry any great distance, which meant that most of the time you got to ride rather than walk. (Quite a plus for an infantryman.) 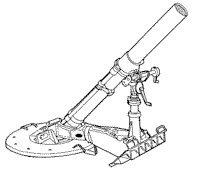 Over three years’ time I worked my way up from the rank of Private, and part of a mortar crew, to a Sergeant leading the Fire Direction Center, which communicated with the observers, computed the firing solutions, and gave the firing commands to the platoon. After three years service in the infantry I decided to return to school and study for a Bachelor of Arts in History at the University of Oklahoma. 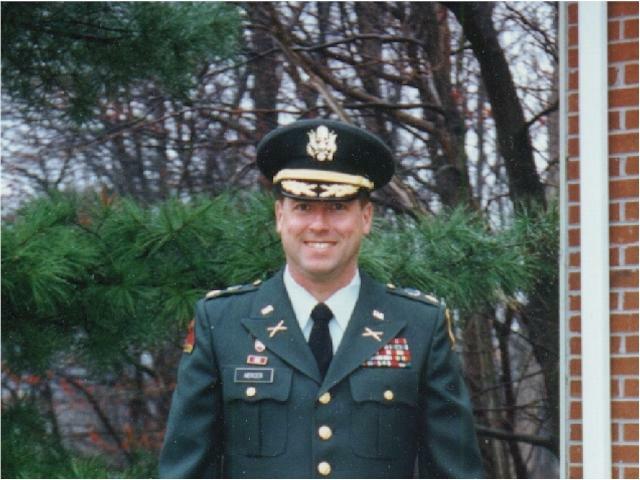 After receiving my degree I reenlisted in the Army to attend Officer Candidate School at Fort Benning, Georgia, and I received a reserve commission as a Second Lieutenant in 1984. 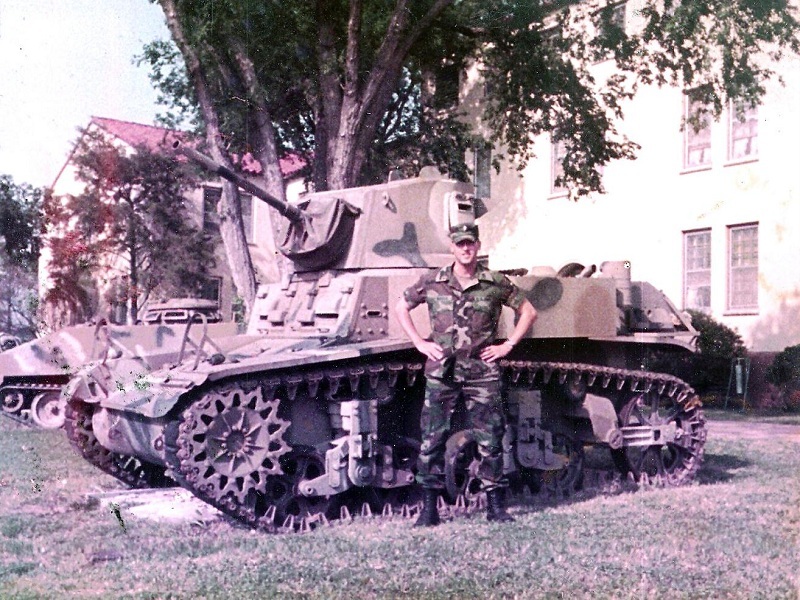 Once I received my commission, my past experience with mortars steered me towards the Field Artillery, and after attending the Field Artillery Officers’ Basic Course at Fort Sill, Oklahoma, I was assigned to the 2nd Battalion, 34th Field Artillery, a self-propelled 155mm field artillery battalion. For the next three years at Fort Sill I served as a Battery Fire Direction Officer, Battery Executive Officer, and Battalion Fire Direction Officer, with a promotion to First Lieutenant along the way. It was quite a busy tour, with field exercises supporting the Field Artillery School, training, and some challenging training deployments; two to the National Training Center at Fort Irwin, California, and one each to Fort Carson, Colorado, and Fort Bliss, Texas. The fire direction duties led me to attend training on TACFIRE, the Army’s fire direction computer for battalion and higher units at the time. In 1987 I left the battalion to attend the Field Artillery Officers’ Advanced Course, was promoted to Captain, and attended follow-on courses in Brigade and Division TACFIRE and nuclear-chemical target analysis. Then it was off to Germany for an overseas tour. In Germany I was assigned to the 3d Infantry Division at Würzburg as the Division Artillery Counterfire Officer. The highlight of the next year was the division’s participation in Reforger ’88, which was the last ‘big’ Reforger Exercise featuring tanks rumbling through the German villages and countryside. After attending the Combined Arms and Services Staff School at Fort Leavenworth, Kansas, I was reassigned in 1989 to one of the 3d Division’s 155mm self-propelled field artillery battalions, the 2nd Battalion, 41st Field Artillery (2-41 FA), in Bad Kissingen, Germany. For the first year with 2-41 FA I served on the battalion staff as the Assistant Operations Officer, and assumed command of the battalion’s Headquarters and Headquarters Battery in early 1990. 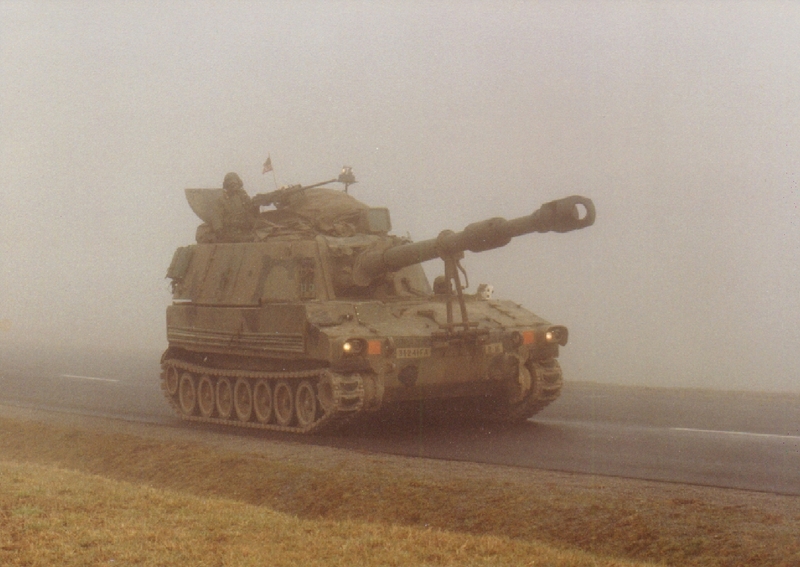 I led the battery during training deployments to Grafenwöhr, Hohenfels, and Wildflecken, Germany. As luck would have it, I was still in command when Iraq invaded Kuwait and the Persian Gulf War broke out. My battalion and the brigade it supported was attached to the 1st Armored Division and sent to fight in the Persian Gulf. My training and experience during previous deployments stood me in good stead, and I served with a superb bunch of soldiers. The 1st Armored Division was part of the VII Corps pincer movement that encircled the Iraqi right flank and crushed elements of the Iraqi Army during the Battle of Medina Ridge on February 27, 1991. The 2-41 FA fired over 1,000 rounds in many fire missions during the two-hour battle. After the hostilities ended, I turned over the battery’s equipment to another unit in Saudi Arabia and returned with the battery’s soldiers to Germany. The battalion was inactivated in Germany in 1991. After command, I was assigned to Headquarters, US Army Training and Doctrine Command (TRADOC), at Fort Monroe, Virginia. I spent a year as a security assistance officer coordinating training for foreign military officers in US Army schools. I was then selected to join the TRADOC Command Group, first as a Special Assistant to the Commanding General, General Frederick M. Franks, Jr., and then as Assistant Secretary of the General Staff. I had a very rewarding three years’ time coauthoring “Leadership and Command on the Battlefield: Battalion and Company” and editing command correspondence and publications. In 1995 I left Fort Monroe to serve in my Functional Area, Systems Automation. While attending the the US Army Computer Science School at Fort Gordon, Georgia, I was promoted to Major and received my commission in the Regular Army. My Functional Area assignment was as a System Analyst with the US Army Intelligence and Security Command at Fort Belvoir, Virginia. In support of Joint and Army intelligence centers in the continental US and Southern Command, I reviewed site architectures and system automation requirements and requisitions. During the period I studied nights and weekends to earn a Master of Science in Software Engineering Administration at Central Michigan University, completed in the winter of 1997. Afterwards, I requested and was granted a local transfer to the US Army Test and Evaluation Command (ATEC), headquartered nearby in Alexandria, Virginia. With the acquisition community at ATEC I worked for the next three years as an Evaluator of fire support and command and control systems. I was involved with several projects, the most interesting of which was the High Mobility Artillery Rocket System (HIMARS), and I helped ensure its successful transition from an Advanced Concept Technology Demonstration into System Design and Development. HIMARS subsequently went into Full Rate Production and has proven itself in combat. My last assignment in the Army was a chance to make sure that the systems acquired for future soldiers work as they should. In Summer 2000 I completed my Army career with just a little over twenty years’ service. The awards received during my Army service are shown at left. From top to bottom, left to right: the Bronze Star Medal, the Meritorious Service Medal with two Oak Leaf Clusters, the Army Commendation Medal with three Oak Leaf Clusters, the Army Achievement Medal with two Oak Leaf Clusters, the Good Conduct Medal, the National Defense Service Medal, the Southwest Asia Campaign Medal with three Stars, the Armed Forces Reserve Medal, the Kuwait Liberation Medal (Saudi Arabia), and the Kuwait Liberation Medal (Kuwait). Not shown are the Army Service Ribbon, the Overseas Service Ribbon (with “2” Device), the Valorous Unit Award, and the Honorable Order of Saint Barbara. 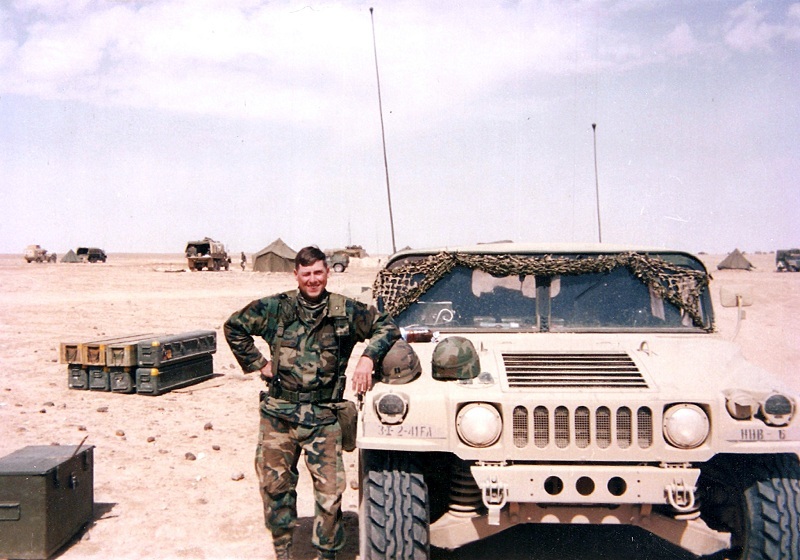 After leaving the Army in 2000, I elected to continue in defense acquisition as a consultant. While employed by Computer Sciences Corporation and later Northrop Grumman Information Technology, I provided analytical support for ATEC from 2000 until 2003. During the period I authored test and evaluation plans and reports in support of acquisition decisions for Army systems that included the Advanced Field Artillery Tactical Data System (AFATDS), Stryker, and the Surfaced-Launched Advanced Medium Range Air-to-Air Missile (SLAMRAAM). In 2003 I joined Science Applications International Corporation to provide analytical support to the Office of the Under Secretary of Defense (OSD) for Acquisition, Technology, and Logistics. While there I assisted with OSD oversight of the systems engineering and test and evaluation of many major defense acquisition programs including Abrams, Bradley Fighting Vehicle System (BFVS), Business Systems Modernization (BSM), Excalibur, the Family of Medium Tactical Vehicles, Force XXI Battle Command, Brigade-and-Below (FBCB2), Future Combat Systems (FCS), Guided Multiple Launch Rocket System (GMLRS), HIMARS, the National Airspace System (NAS), the P-8 Poseidon, and Stryker. 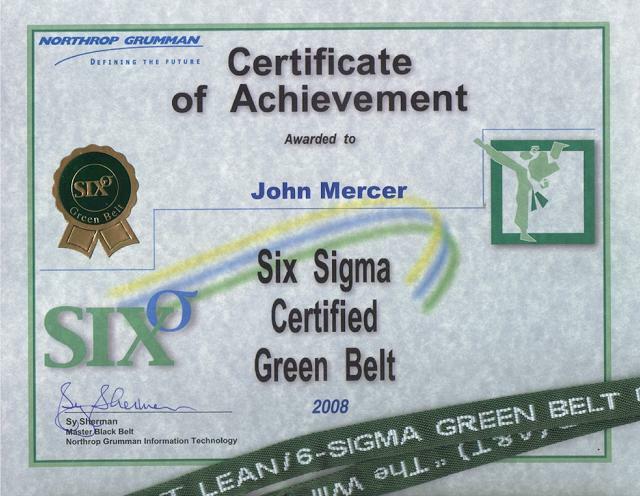 In February 2008 I completed almost five years supporting systems engineering and test and evaluation for OSD, and was awarded a Six Sigma Green Belt for work on a Lean Six Sigma project to streamline and improve the processing of Test and Evaluation Master Plans. In February 2008 I decided to give up on defense consulting and I now live at home in Northern Virginia in the company of an affectionate cat. The things that keep me busy these days are organizing events for a local hiking group, amateur photography, blogging, collecting and writing about coins, PC and board gaming, and reading about current events, history, and historical fiction.